Welcome to southwest New Mexico! EZ Big Rig pull-thrus & year round indoor pool & hot tub. The perfect home base to explore historic Deming & the region. State parks, museums, vineyards, golf & day trips to area attractions. My wife and I spent four nights at Little Vineyard RV Park in late February 2019. We had originally planned on a two night stay but we extended for two more nights. The manager and staff were very friendly and helpful. In addition the manager went above and beyond when we needed a favor. We have a 40 foot motor home with a towed vehicle. The sites were spacious and had plenty of room for parking. The restrooms were clean and well maintained as were the laundry facilities. The washers and dryers were also very reasonable priced compared to other parks. The park has an indoor pool and hot tub, and a newly renovated rec hall with lots of special activities. They have a bingo tournament one evening, an ice cream social another evening, and even an opportunity to gather with a handful of local gentlemen for a friendly poker game. There is something going on in the rec hall everyday. If we are traveling through southern New Mexico again we will definitely plan another stop at Little Vineyard RV Park. Hostess was most accommodating for our one-night stay. The campground was clean and well-equipped. Sites were not on top of one another. My wife commented on how clean the bathrooms and showers were. Deming itself not that appealing couldn't find anything but fast food places. It is very convenient to Rt 10, and felt like a secure place to be for the night. How awesome that this place has an indoor heated pool AND hot tub! It was amazing! My husband enjoyed playing pool in the game room, my son loved the swimming pool and my dogs LOVED the dog park! And SO many activities we could all enjoy. Can’t wait to be back here! The park is conveniently located just off I-10 in Deming, NM. The entire park is gravel and pea rock. It is hard packed so even when rained upon it remains solid. July is probably the height of the off season for the park. There are a number of year-round residents, but the rest of the park is basically empty. If you require 50 amps you will need to be placed in the back two rows of the park. There are no shade trees. Just about every site has a table but it is too hot to set outside until the sun goes down. The cable TV is pretty good with a wide selection. Showers and restrooms are clean and functional. There is a fenced dog park but there is not a stitch of grass in the dog park. We did not use the pool or other amenities because we spent our time exploring the area. There are numerous attractions that are either in town or within an easy day trip. There is a Wal-Mart about 1 ½ miles down the street. The office staff was very friendly and accommodating. $27/nt (Good Sam discount) for 50 amp pull through site with full hook ups. WiFi is great!! We stopped here for 1 night on a cross country trip. It was conveiniently located near the interstate. Staff made us feel welcome. The site was big enough for us to stay hooked up with our 41 foot 5th wheel. The whole park is gravel. So, it does feel a bit like a parking lot. But it was neat and clean and had what we needed for an overnight stay. Our dog was not used to doing business on rocks, but did get with the game plan. The restrooms were spotless, comfortable and even had music. 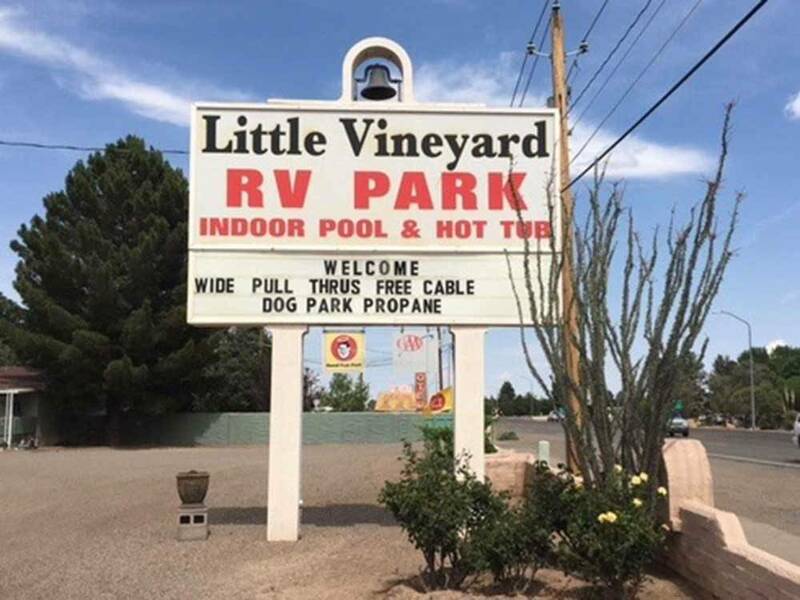 We stayed at the Little Vineyard RV Park in Deming, NM, overnight. We were extremely pleased with the staff. The facilities were excellent. Access to the park from I-10 was very simple. Plenty of room to maneuver when towing a car dolly. Will definitely keep this park in mind when traveling in New Mexico and will recommend it to all RV'ers we meet. If you need 50 amp, pull-thru, you will be in the last row. WiFi is a known issue. The sites are mainly dirt and dusty. They have two laundry areas. The one's by the office are cheaper but the ones in the back are very nice and worth the extra cost. They have an indoor pool/spa. Nice rec room. We've stayed here for at least 15 years. It's fairly dusty and usually very windy. The park has gravel and dirt very level roads and sites. The rates are very good and we sleep very well here. We look forward to the train whistles at night but if you don't like train whistles go elsewhere. The wifi was terrible especially in the back. New people coming through in larger coaches tend not to know exactly where to park and sometimes end up a little in the road. The bathrooms are usually very clean but old. There is a laundry on premises and the staff has always been helpful. Friendly staff. Clean facilities. Dated but,well maintained. Great place to stop on the way through New Mexico. We were scheduled to stay 2 nights but my friend ended up in the hospital and the people at the park were very helpful. The sites are clean and long. restrooms are very clean. Laundry is very clean and reasonable. Cable is good and wifi is fare. I would stay here again anytime. PS: the hospital in Deming was very good. Great staff. I was impressed. Very clean and a nice park overall. You won't be disappointed! Fine for an overnight stay. Level wide sites. Easy access. Restroom was clean but very dated. Would like to see this place updated a little. Price was good. Some train noise but did not bother us. Visit Rockhound State Park, Gila Cliff Dwellings, the Florida Mountains. Enjoy Deming Luna Mimbres Museum, stop at one of our fantastic wineries for a taste, or experience Deming Duck races in August.